I was the fist customer of the season at Amorgis Studios. It exceeded my expextations even when it was very early in the season. I can write a lot about how beautiful Amorgos and how lovely the beaches and the nature is. The vieuw from the room, the cleaniness of the room,... but what I really want to let you know is how wonderfull the stay was at Amorgi Studio. The ever friendly Panos and his mother are actually the main reason to stay there. Panos picked me up from the ferry at 02 am without any problem and made me feel right at home. You feel the love and care that he puts in everything. I watched him preparing everything for the coming season and i can assure you that it will be more than ok. It's already the second time i go to Amorgos and i absolutely prefare Aegiali over Katapola. Rent a little car and discover the island. It's so beautifull and enjoy staying at Amorgi Studio, I certainly go back this year!!!! The house offers a nice view over the bay and the village of aigiali and is at a walking distance from the nearby beaches and the village. The staff was exceptionally friendly and attentive to our desires and needs. Panos was an exceptional host, he was always available to help with questions and gave us lifts into town when he could. His recommendations for walks, restaurants and beaches were brilliant and very helpful. The location, view, and style of studio were exactly what we were looking for. 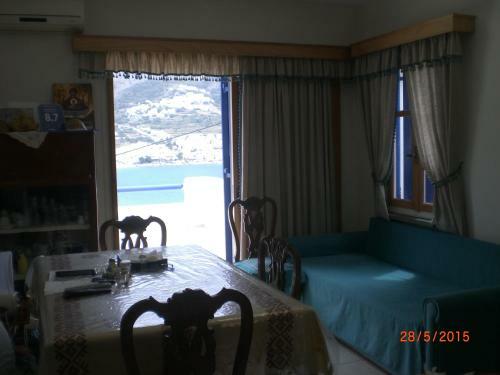 Location is fantastic, lovely view over the sea, the small town... the beach. Mr Panos is very kind and gentle, present if and when needed. We received fresh fruit, olives from the tree in the garden and homemade marmalade at our arrival! Being waked by the roosters and the donkeys was an authentic experience we all enjoyed. Beach is at walking distance and the view from the terrace is astonishing. We found the stay exactly what we were looking for ... simple and authentic. The location of Amorgi Studios is superb, as it offers a great view to the bay of Aegiali and the village. It is 1km from the village of Aegiali, and you can walk there from the beach as it is 5mins to reach. From the entrance, you can catch the footpath to Levressos, Psili Ammos and Hohlakas beaches. Great great walk! Rooms are very clean and well equiped. Highly recommended, as it is a super chill out place, with warm hospitality from Panagiotis! Thanks for the delicious home made marmelades! Very good position, really near to aegiali beach and centre. Wonderful seaview from room's veranda. Spacious and very clean room. The location just above the far end of Aegiali beach offers a great view of the bay and town, good swimming nearby and a lovely 15 minute walk along the beach back into town. Panos is a friendly and helpful host and the 1 bedroom apartment was spacious and well equipped. Lock in a great price for Amorgi Studios – rated 9.5 by recent guests! One of our best sellers in Aegiali! 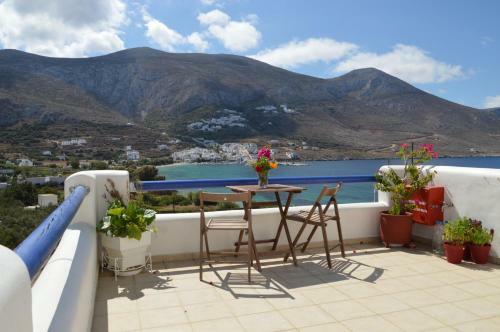 The Cycladic-style Amorgi Studios is located 250 feet from the long, sandy beach of Aigiali in Amorgos. It offers self-catering accommodations and free 2-way transfer from Aigiali village, where restaurants and mini markets are located. All spacious studios and apartments open to a shaded and furnished balcony or patio with views over Aegiali Beach. Decorated in pastel colors, they include a kitchenette or kitchen with a mini oven with cooking hobs, fridge and coffee maker. Air conditioning and satellite TV are provided. Staff at Amorgi can arrange car or motorbike rental to explore the island. The scenic Amorgos Town with the whitewashed houses and windmills is at 11 mi. The fishing village and main port of Katapola is 15 mi away. Aigiali Port is at 2,650 feet. When would you like to stay at Amorgi Studios? 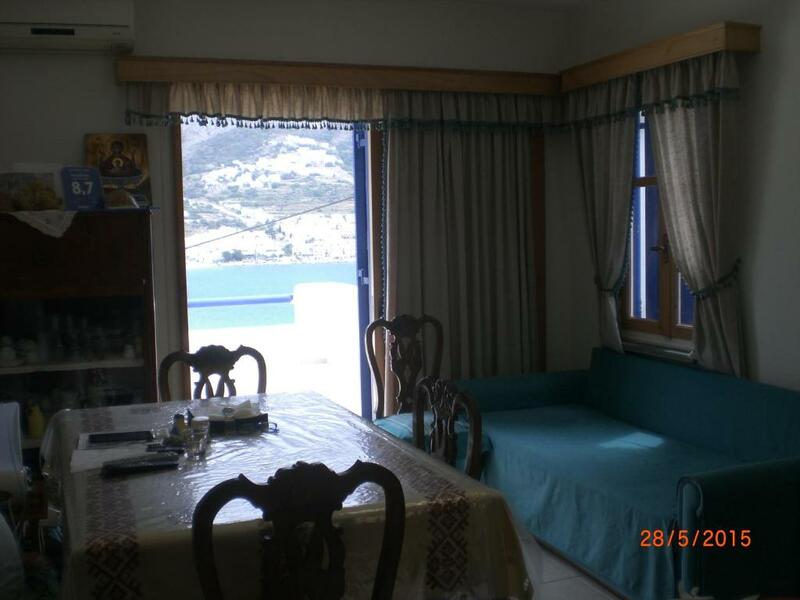 This air-conditioned studio opens to a furnished and shaded patio with Aegean Sea view. Decorated in pastel colors, it includes a kitchenette with a fridge, mini oven with cooking hobs and satellite TV. It consists of 2 spacious, connected studios, each opening to a furnished balcony with Aegean Sea views and 2 bathrooms. Decorated in pastel colors, it includes a kitchenette with a fridge, mini oven with cooking hobs and satellite TV. Opening to a 50-m2, furnished balcony with sea views, this spacious apartment is located on the 2nd floor. It has 2 bedrooms, each with a private bathroom, and a kitchen with oven and dining table. The Cycladic-style "Amorgi Studios" is located 100m from the long, sandy beach of Aegiali in Amorgos. Located at the opposite side of the port and the village of Aegiali, it is a quiet, close to nature, picturesque holiday establishment. Situated on path No 4, it is ideal to start short or long hiking tours to the nearby villages and beaches, visiting interesting sites or medical herbs to study and pick. Access to Aegiali village and port: 15' walk, 2' driving. For arrival and departures, as well as for your shopping, we offer transfer. Please give us an advance notice. All studios (ground floor) and apartments (1st and 2nd floor) open to a furnished and shaded patio or balcony with very nice sea view! Including sitting/dinning indoors and outdoors area, a/c, kitchenette with mini oven and cooking hobs, electric kettle, hair dryer, fridge, tea and coffee maker, wifi and sat tv. The reception of “Amorgi Studios”, where our family is occupied, functions from 9 AM to 3 PM and from 6 PM to 9 PM and is always willing to welcome you. Moreover, you can always find someone 24 hours to help you in a case of emergency or after midnight when the late boats arrive. Hello and greetings from Amorgos! We take hospitality seriously and put our best effort into making your holidays unforgettable! Should you have any query or special request or need any information, please do not hesitate to contact us, it is pleasure to be of assistance! Only 5min. walk from Aegiali Beach, situated on path No 4, it is ideal for short or long hiking, or canoeing tours to the nearby villages and beaches, visiting interesting sites or medical herbs to study and pick, grabbing the opportunity to find yourself closer to nature in secret places that a few visit. Do not forget to visit the picturesque villages of Potamos, Lagada and Tholaria, built on the slopes of the mountains that embrace the port of Aegiali. House Rules Amorgi Studios takes special requests – add in the next step! Amorgi Studios accepts these cards and reserves the right to temporarily hold an amount prior to arrival. Please note that the property can arrange transfer from Katapola and Aegiali Port upon charge. Guests are kindly requested to inform the property in advance if they wish to make use of this service. Contact details can be found on the booking confirmation. Please inform Amorgi Studios of your expected arrival time in advance. You can use the Special Requests box when booking, or contact the property directly using the contact details in your confirmation. Free picked up at port middle of the night!